"You can't be your mom's supermarket anymore," one expert said. Instead of taking a trip to a local grocery store, more and more consumers are opting to order essentials such as cereal, toothpaste or even apples from online retail giants. 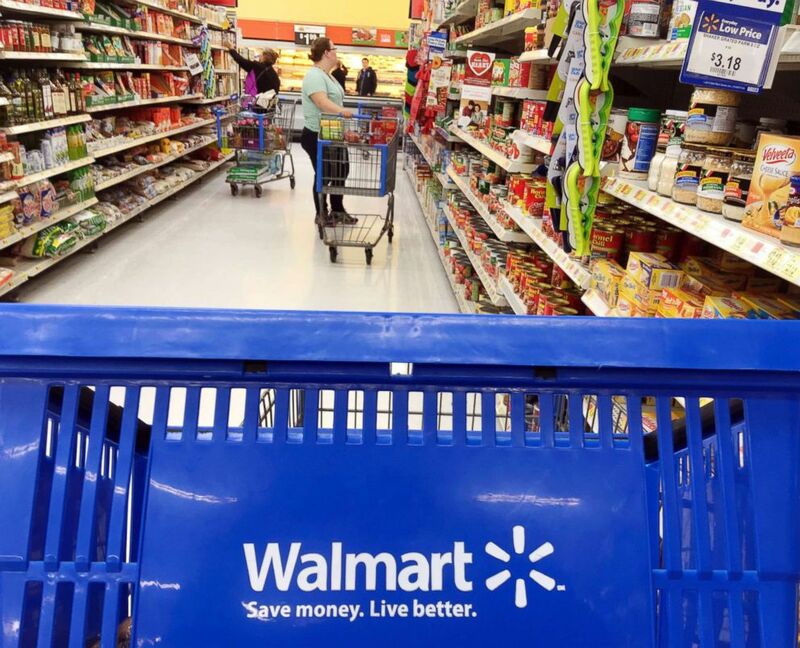 Walmart, for one, announced Wednesday that it is bolstering its grocery-delivery service to reach even more cities. (Elise Amendola/AP,FILE) Customers shop for food at Walmart in Salem, N.H., June 5, 2017. The service, previously available in just six markets, will expand to 100 metro areas, the company said in a statement. 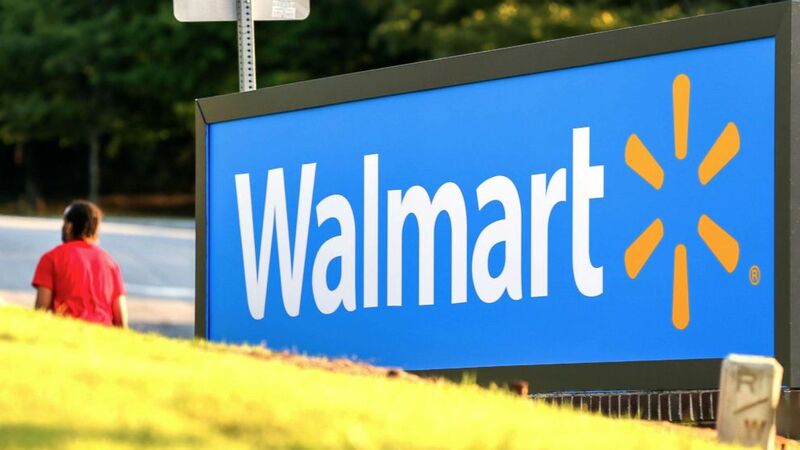 Walmart is already the country's largest grocer, with 90 percent of Americans living within 10 miles of a store. "Online is the future of grocery," said Richard Kestenbaum, a retail industry expert and partner at Triangle Capital LLC. "Especially for packaged goods, but eventually even for fresh produce and protein." It's a market worth tens of billions of dollars, and "everyone is doing all they can to focus on maintaining share," he added. Walmart's announcement follows Amazon's aggressive expansion into food by purchasing Whole Foods. The retail heavyweight acquired the grocery chain last year to supplement its AmazonFresh delivery program. Since then, grocers Kroger and Albertsons, which owns Acme and Safeway stores, have partnered with Instacart, another online grocery delivery service, to offer their shoppers a similar convenience. 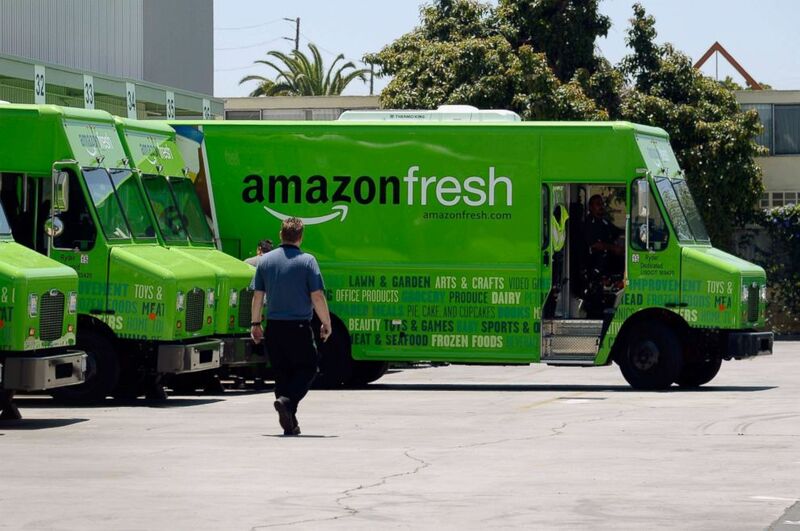 (Kevork Djansezian/Getty Images) An Amazon Fresh truck arrives at a warehouse, June 27, 2013, in Inglewood, Calif. In fact, this past week, Kroger announced plans to expand its partnership with Instacart to increase delivery coverage this year. Even Target Corp. is leaning into grocery delivery with its December 2017 acquisition of Shipt, an online same-day delivery platform. By 2022, online grocery shopping could be a $100 billion industry, and as many as 70 percent of consumers could be doing a portion of their food shopping online, according to a report co-authored by Food Marketing Institute and Nielsen. Their original projection for those growth numbers was 2025, but with Amazon's aggressive move leading other grocers to step up their e-commerce options, FMI and Nielsen shortened their projection by 3 years, Mark Baum, the chief collaboration officer at FMI told ABC News. "Depending on what happens the next two or three years, we may revise it again," Baum said of the projection. "Food is like the holy grail because we all have to eat," he added. "Food has, categorically and broadly speaking, more trips than other category, consumers can relate to it easily, and it's is an area of growth." One of the biggest challenges retailers face in breaking through with online grocery sales is delivering produce and meat. "The perishable-item problem has to be solved in order for consumers to feel comfortable," Kestenbaum said. Shoppers often feel most comfortable picking out fruits and vegetables themselves, he explained. "A lot of the purchases online now are the packaged goods," John Karolefski, grocery industry expert and editor of GroceryStories.com, told ABC News. Price is another obstacle for some grocers looking to sell online. (Erick S. Lesser/EPA via Rex) A man walks by the entrance to a Walmart store in Decatur, G.a., on Aug. 27, 2015. "Lower prices is the key, and traditional grocers have to respond to that," he added. Smaller grocery chains are finding it challenging to step into a digital space flooded with huge competitors. "Every smart grocer has to offer online grocery shopping option because if they won't, their competitors will," Karolefski said. "They'll go down the road and order from somewhere else, and it's no trouble to go down the road when you're online." For most shoppers, it comes down to one word: convenience. "As long as it doesn't cost them money," Kesterbaum said. And a company like Amazon can deliver products as quickly as anyone, said Karolefski, adding that "Amazon is the endless aisle, and a lot of grocery stores can't do that." Millennials using more e-commerce is also driving grocery deliveries, Baum said. Those "who grew up in digital are picking this up more quickly than other age groups." "You cant be your mom's supermarket anymore," Karolefskki said. "It's gone and it's changing. But brick-and-mortar supermarkets aren't going away soon, as 97 percent of groceries still are purchased in stores, Karolefski noted. "In-store experience is different because it's sensory," Baum said. "Food represents a great way to be social. You can't really do that online."